you know how way-back-when when someone had their vacation pictures processed and then forced you to look through them all? that might be what my tokyo posts turn into. the goals for today’s outing where the tokyo sky tree and ended up with a bonus – the world beer museum. we started with competently managing the trains – well, mostly competently. we also learned that if 5 white folks stand in front of the train map looking lost some kind person will step up to help. thanks kind people. michael was in charge of today’s itinerary and i didn’t study it too closely. the only real goal we had for today was the tokyo sky tree. michael knew he wanted to go to the world beer museum at some point, but we hadn’t connected the dots, yet, so we weren’t aware that they were at the same location until we were at said location. we started with the beer museum – well, we actually started out getting our tickets for the sky tree and then ended up with a three hour wait and since we had empty bellies lunch was where we started. after lunch we still had some time to kill so we wandered the mall and took advantage of several photo ops. then the tree. the sky tree. the first stop was 350m. then we headed up to 451.2m. the pictures from that high looked surprisingly similar to the ones from the level below – i can’t tell which are which. but we did find a mirror. after the sky tree we were all exhausted. we picked up dinner to go and headed home. we took the long way to the nearest train station. or rather the second nearest, the nearest didn’t have a train going the direction we needed it to go in. but while we were wandering we did come across two separate bicycle parking lots. bikes seem as big here as motorbikes in chiang mai. we also got a cool view of the tokyo sky tree. i bet the view from up there at night is amazing. we made it back to the apartment and tucked in for dinner. what did we eat? pork cutlet sandwiches. they were on a must eat while you’re in tokyo list that google showed me, so when i saw that we could get them at the mall (the brand google recommended no less) we went for it. they were good. i’d put them in the comfort food category. and there’s no shame in being comfort food. tokyo – day one. (i’ve done the planning for this vacation with the help of the many people who have taken the time to rate must see attractions in tokyo.) today we started with yoyogi park. getting a late start (it was after 12:00 by the time everyone got up and dressed) wasn’t the best for being able to fully enjoy the goings on at yoyogi park, but we still had a great time. we started our trip out hungry so first order of business was finding lunch. which meant a walk out of our neighborhood for a little exploring. right off the bat we came across a picture of tommy lee jones hawking canned coffee. who knew? then we found a mirror. we walked down ninja alley – that’s not an official name, but since we know we are staying in the ninja district michael’s certain this is where they did their ninja stuff. just like michael. a restaurant. where we had to point and pray that the pictures were a good representation for what we ordered. not one complaint – everyone left happy and full. right now we’re all in agreement that japanese food rocks. dr. pepper in japan – what the what?? we tackled the train system next. i didn’t get any pictures of our struggles doing this. it wasn’t overly difficult, but the language barrier was noticeable and it took a lot of focus to make sure we got headed the right direction. but once we got where we were headed we came out of the station to see takeshita street and lots of people – including these gals who seemed to be just hanging out. and then we got lost. so we did lots of walking. and this drove by us – i had no idea what they were but the guys got very excited. from what i could gather from what the boys were saying is that they’re like life size rock ’em sock ’em robots. i can see that they could be pretty cool. chan decided to see if he could help. he took the map and had a seat – a wet seat. he was a big help – laughter always lightens the mood. eventually we found yoyogi park. where we were greeted by some very friendly folks. we grabbed a few free hugs and high fives, but they were so fast we didn’t get any pictures. finally we headed into the park. it was beautiful. and cool. but not too cold. just right. there were fish to look at and turtles to watch. and some not so fancy potties with worrisome signs. barrels of sake wrapped in straw. you can read about it if you want. casks of wine for consecration. and incredibly we came across the travelocity gnome. it’s a little known fact that gnomes take all the get-up-and-go out of you. eventually we did get up and go again. and – amazingly – we found another mirror. we finished at the park and headed out for the two other things on my list that we had to do while we were in this part of tokyo. one was find the hachikō statue. go us! and the other was see shibuya crossing. conveniently, that’s where the hachikō statue is located. we were all exhausted and hungry so we ate at mcdonald’s. that was chan’s choice. he says you’re supposed to try mcdonald’s everywhere you go. it’s some kind of travel law – or something. i don’t know what i ordered, but it was pretty good. everyone else ordered what they would have at any other mcdonald’s and they said it was better than they’d had before. the only thing i’m certain of is that this extablishment had the best fancy japan potty i’ve ever experienced at a mcdonald’s. the button that looks like it plays music doesn’t really. it plays toilet flushing sounds. my guess is for discretion. chan and i left chiang mai yesterday and the goodbyes at the airport were a validation that our decision to move here was a good one. it was emotional and so very painful, but also proof of how he threw himself into life here. we seem to like to take the not the easiest way possible route when it comes to travel when we go to and from the states and why would we choose to do it differently for a family vacation. michael, a16, and s13 left friday night for bangkok and had an all night layover before heading to tokyo – via kuala lumpur. maybe not the most direct route, but to hear them tell it it was up there with one of the most miserable. chan and i left chiang mai saturday morning (16 hours after the other guys) we flew to bangkok had a two hour layover and then headed to tokyo. directly to tokyo. they took the yellow route. we took the purple one. we arrived 1/2 an hour before them and our first stop was the fancy japan potties. after our pit stop we went got our passports stamped and then on to collect our luggage. since we were ahead of the rest of the family we went ahead and gathered their luggage, too. they made it in, we all went through customs and then it was time to figure out how to go about finding the apartment we’d rented for the week. luckily we had an address in japanese and our taxi driver could read japanese (amazing, i know.) our two bedroom apartment was bigger than we expected. it has a washing machine. and best of all it’s vey own fancy toilet. it was well past midnight at this point and we had 3 hungry kids on our hands. so michael and i braved it and found a convenience store where we picked up some assorted snacks. including the goldilocks and the three bear version of cup noodle. we were all asleep by 3am. that’s way past my bedtime and we ended up sleeping a tad late on Sunday morning. which was alright, because i’d purposely left sunday as a pretty easy tourist day. michael was invited to train a course in muak lek, thailand. the folks who invited him were kind enough to invite the rest of the family along, too. c19 had other, more pressing, senior-y type things to do, but a16, s13, and i were game for a weekend at a resort and 24/7 air con. the other thing we were all looking forward to was picking up krispy kreme donuts while we were at the don muang airport in bangkok – i’ll get back to that. we flew into DMK – that’s don muang airport. and were picked up and given a ride to muak lek – a few hours outside of bangkok. we arrived after the dining room was closed. but not to be starved we headed out to find some dinner and lucked into a little mookata restaurant – a thai bbq place where you’re in charge of your own grill. after dinner we checked into our rooms (wish i’d taken a picture, we had a very nice 2 bedroom/2 bathroom with a living room cabin). we quickly (there might have been a little drama) divided up boys’ room and girls’ room. turns out brothers and sisters – when they are a 16 year old girl and 14 year old boy – aren’t so keen on room sharing. michael had to be up bright and early to start teaching, but the rest of us slept in, then breakfast and an entire day of nothing. i had a little work to do and some reading i wanted to catch up and some air-con i just wanted to soak up. so it was sort of a day of nothing. 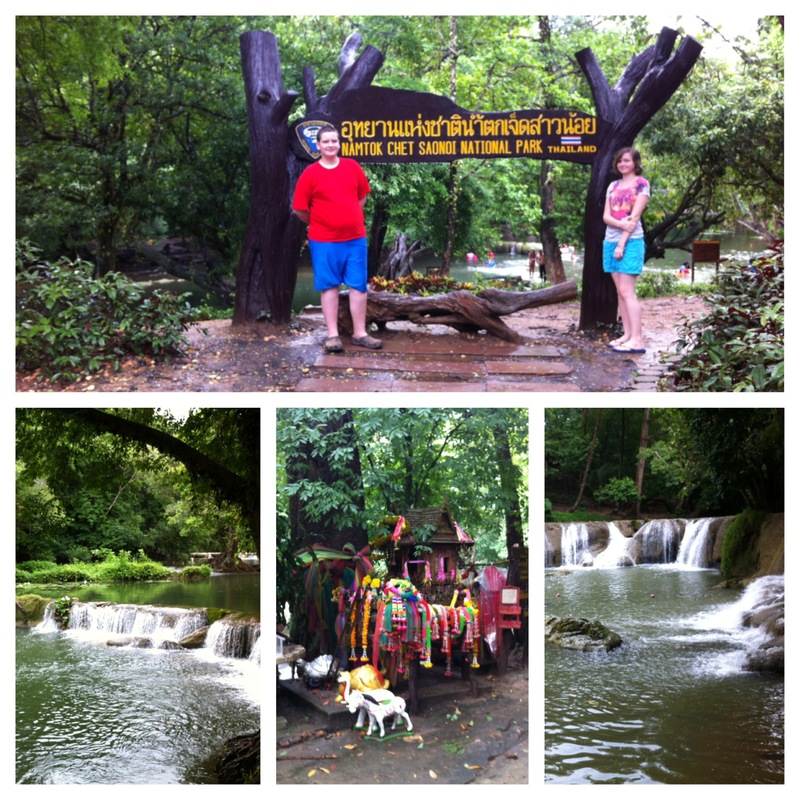 on sunday we got up, headed to worship and then the kids and i ventured out to chet saonoi waterfall. it was nice and cool and very pretty. we hiked around for a bit and then headed out to what see what google said muak lek was famous for – the milky way. 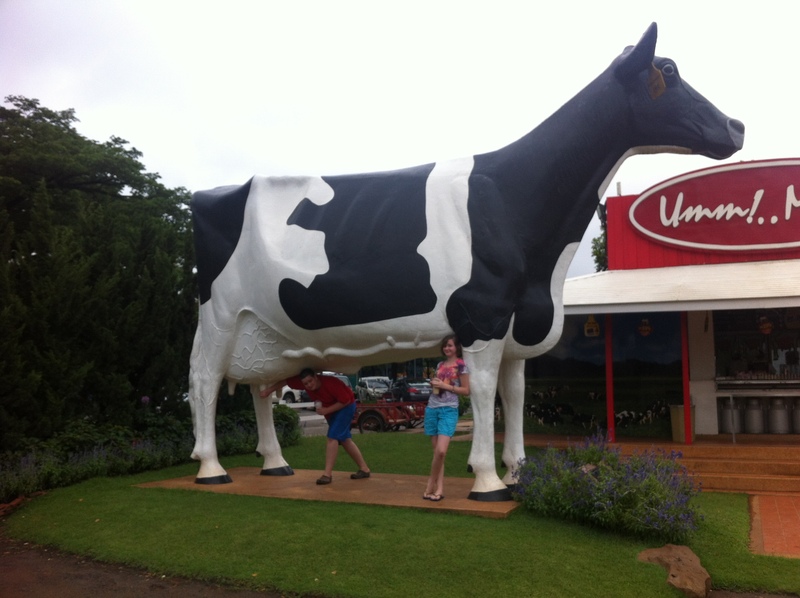 there are a lot of dairies. big ones. and farm chokchai is all set up for tourists. the kids fed calves. they had ice cream shakes. really, really good ice cream shakes. we felt a little guilty about eating burgers. and we skipped the tour. i was the only one really interested in it – it was 2.5 hours long and all in thai. if we’d made prior arrangements english could have been arranged, but since my dairy thai isn’t all that good i figured the kids were right on this one. and besides, i was coming down with a migraine. and if you’re gonna have a migraine and take to the bed, it’s very, very nice to be able to do that in an air-conned room. michael had to train a good bit of monday and then it was time to return to the airport. michael was a little slow getting through security – he’d forgotten about the 8 pairs of scissors he had in his backpack. but they were discovered and confiscated and then we were on our way. we quickly located krispy kreme. it was open. and it was donut-less. not one donut. there was a little disappointment, but not too much. everyone knows we’re only weeks away from the land of donuts. we got home a little late on sunday night and kids returned to school on monday.